Nuedexta in Nursing Homes: Is Your Loved One at Risk? Nuedexta is an important drug that is approved by the Food and Drug Administration (FDA) for the treatment of pseudobulbar affect (PBA). People with PBA have neurological conditions that cause them to laugh or to cry suddenly and involuntarily. The laughing and crying is not always consistent with their true emotions and, as a result, it can interfere with their communication, their relationships, and with their daily living activities. Very few people suffer from PBA, and fewer still both have PBA and reside in nursing homes. While PBA can occur in people with dementia, it is estimated that only 5% of people with dementia also have PBA. Investor documents from the company that makes Nuedexta, Avanir Pharmaceuticals, indicate that only a small percentage of people with PBA reside in long-term care facilities. However, nursing homes are describe as “key” to the company’s growth of this medication and more than half of Nuedexta sales are for nursing home residents. Why Are Nursing Homes Using Nuedexta? According to a CNN investigation, state regulators have found that doctors are prescribing Nuedexta for nursing home residents to make them easier to manage in the nursing home setting. Specifically, doctors are claiming that the patients have PBA and are writing prescriptions for Nuedexta when there is no evidence of PBA, but instead a desire to manage confusion, agitation, and other behaviors in residents with dementia. There is also a growing concern that some of the doctors who are prescribing Nuedexta are compensated by the drug’s manufacturer, Avanir Pharmaceuticals. CNN reports that thousands of doctors who prescribe Nuedexta have received money or other compensation, such as meals, from Avanir. It is alleged that in 2015 almost half of the doctors who prescribed Nuedexta and whose claims were filed with Medicare received some kind of compensation from Avanir. Exposing nursing home residents to side effects from an unnecessary medication. Side effects may include rashes, dizziness, falls, comas and death, for example. Dangerous interactions with other medications. Many nursing home residents are on multiple medications for various conditions and all drug interactions must be considered prior to starting a new medication. Increasing a nursing home resident’s risk of a fall. One study found that nursing home residents with Alzheimer’s who took Nuedexta fell at twice the rate of residents with Alzheimer’s who were receiving a placebo. Nuedexta has not yet been extensively studied in geriatric patients. Therefore, there may be additional dangers that we do not yet know about. The rise in the use of Nuedexta in U.S. nursing homes happened around the same time that the government began to investigate and stop the use of antipsychotic drugs to manage resident behavior. 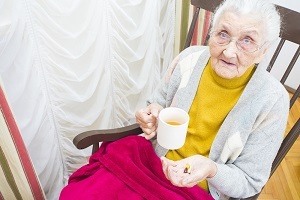 It is important to note, however, that the use of any drug as a restraint or to make the lives of nursing home staff easier may be nursing home abuse or negligence, absent a valid medical reason for prescribing and administering the medication. This is known as a chemical restraint. When Nuedexta is used as a chemical restraint, it puts nursing home residents at risk. If this has happened to your loved one, then it is important to take action as quickly as possible. Your loved one’s time to file a lawsuit is limited by law. You can help your loved one get started protecting her rights, holding the nursing home accountable, and helping to keep other Kentucky nursing home residents safe by contacting us today for more information. We would be pleased to provide you with a free consultation. Simply contact us any time to learn more or download a complimentary copy of our free book, Fighting Back Against Nursing Home Abuse: What Families Need to Know to Help Their Loved One. Can an Unprescribed Medication Be Used to Sedate a Nursing Home Resident? Is Your Loved One at Risk for Over-Medication?